Charcuterie boards offer the perfect opportunity to pair fatty, sweet, salty, and nutty flavors with the proper wine to draw out additional flavor profiles. From classic to contemporary, we have a number of charcuterie boards and cutting boards as well as tasting bowls and spoons for sauces. Offering the right pairings of wine and cheese can encourage guests to stay longer and try more wines at your winery, bar, or osteria. Find more supplies needed for proper wine service including corkscrews and wine bottle openers, wine buckets and wine coolers, and ice picks. 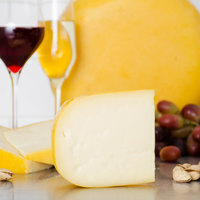 If you're wondering where to buy farmer rudolph&apos;s wine and cheese pairings, we have a large selection of farmer rudolph&apos;s wine and cheese pairings for sale at the lowest prices.